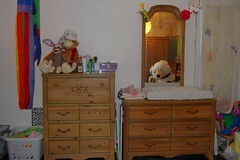 Way back when, I promised pictures of Shae's bedroom once I was done redecorating it to accommodate the big girl bed. Um, looks like I never did that, so I guess now that we have a new wardrobe and hanging lamp from Ikea, it might be a good time to give you the grand tour. 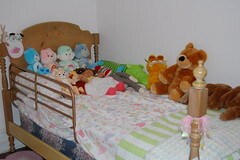 Here is what the bed looks like these days (L-R, mostly): Little Nutbrown Hare, a dalmatian Beanie Baby, Bedtime Bear, Cheer Bear, Gentle Heart Lamb (a Care Bear Cousin), Grumpy Bear, a stuffed cat, Linny from Wonder Pets!, a Cabbage Patch doll that Shae got for her 1st birthday but whose name we can't remember so she is called "Baby,"* a sock monkey that Shae calls "Monkeyhat," a stuffed crocodile, one of G's old Garfield toys, the stuffed bear that I got at my baby shower at work, and a stuffed dog that G gave me while we were still dating. Yes, she actually sleeps in this bed. Under all that mess are the "polka dot fairy princess flower butterfly" sheets (that's what she calls them), and at the foot of the bed is a "Nannie Hallman blanket." Shae can't say "Haldaman" yet. In these pictures I can tell how badly we need a dust ruffle -- I'll have to work on that tomorrow. Probably the girliest stuff in the room are the things hanging over her bed -- a couple of tchochkes from her Easter basket, some ribbons from a bouquet of flowers that she got from my mother-in-law on Adoption Day, and her bouquet from my sister's wedding. 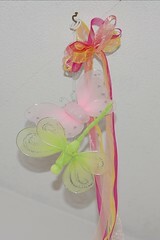 We also have kite tails hanging in her room. The night stand. You've seen the switchplate before. She knows most of those books by heart already. And that's our "travel monster," there on the right -- we take him with us when we go anywhere, because he fits in the side pocket of the diaper bag or, in a pinch, a jeans pocket. 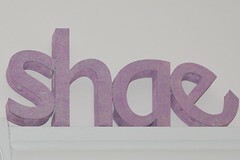 Shae's name, in "lights." This is probably her favorite thing in the room, because she knows what it says. My mom picked these letters up for cheap at a yard sale or something -- they're some kind of foam that I painted and then coated with glitter paint. The dressers. These were (one of?) my sisters'. A bed and at least one dresser to match are in my parents' house -- they've made up a room for Shae for when she sleeps over. I wanted to give Shae my old bedroom furniture, but that suite has a double bed, so it's probably going to end up in a guest room at some point in the future when we buy a house that isn't so damned small. 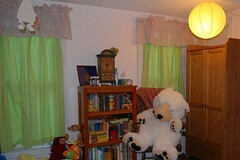 Here's the new wardrobe and lamp in action, next to the bookcase full of books that I won't let Shae touch yet. I know, I know, I'm a terrible mother -- but I have complete sets of Harry Potter, Artemis Fowl, Unfortunate Events, and Septimus Heap novels, which are out of her age range, and I don't want them destroyed. (She's not really interested in them yet, anyway, since most of "my" books have minimal pictures.) 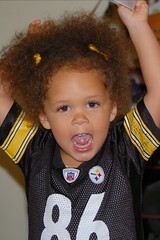 Someday she's going to have the best damn kid's library ever. 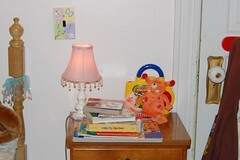 * = And you'll notice that even in a toddler room, nobody puts Baby in the corner. RIP, Johnny Castle. file under Casa Gonzales, Decorating, Dumb Projects, Home "Improvement"